Rick Stevens, lead guitar; & Rod Sheperd, bass guitar. The 45 r.p.m. single is a much sought after collector’s item. The following interview was published in R.P.M #4 back in February/March, 1984, pages 14 – 18. I have received permission from David Walters, author of Children of Nuggets, to use this interview here. Among the many collectable independent labels of the sixties, Fenton Records, ranks high on the want lists of many collectors of “Garage Band” music. The label was started sometime during the early sixties, in Grand Rapids, Michigan, by Dave Kalmbach. The vast majority of records released by Fenton, during its heyday, fall into the category of “Garage Band” rock. Because so many young American bands formed in the afterglow of the “British Invasion,” it isn’t surprising to find this phenomenon in Grand Rapids, Michigan’s second largest city. The following interview was conducted at the Grand Old Country Record Store in Grand Rapids, Michigan, with Ray Hummel, former lead singer of the JuJus, a Grand Rapids group from the mid 60’s. The group had a hit with “You Treated Me Bad”/”Hey Little Girl” on the Fenton label that went as high as Number 2 on the local charts. Dave Walters: When did the band start? Ray Hummel: in about 1963, but I joined the band in ’64. D: How did you come to join the band? The way they got their name was, the sax player’s little brother couldn’t say Junior which was a nickname for him, so he called him JuJu. And that’s where the band got the name. D: Would you name the members of the JuJus? R: The original group: Rod Shepard played bass and did some lead guitar work; Bill Gorski played the drums; Max Colley played the sax; I played the rhythm guitar and harmonica and sang. D: When and where were the first gigs you and the JuJus played? Do you remember? R: We did a lot of gigs at Godwin High School, where a lot of the guys were from. We played all the high schools in this area. We played the Ponytail and a lot of clubs in Holland, Michigan and a lot of cities around Grand Rapids. D: Where did you first record, and was that recording issued? Did you record a demo some place first? R: I’m glad you asked that. A friend of mine let me use an audio disk for our first recording session and we did a tune called “Runaround” which is a song that I wrote. We also put on old George Gershwin tune called “Summertime,” and “Hey, Little Girl,” the beginning version without bass guitar in it as a demo. D: When was your first single released? D: That was the Fenton single? D: Why did you leave the group? R: I left the group because I was getting married. The truth is, I shouldn’t have gotten married and left the group because I had a real good recording contract offered me because I was the writer of the songs. R: With Drummond Records in Detroit. D: You left the band and recorded again for Fenton, when was that? R: ’67. What I did was, I took parts from two different bands and put them in the studio together, recorded the single, and released it under my own name. D: Who were the members of that band? R: There were some members from the Legends, and some members from the JuJus. Bill Gorski was the drummer, Max Colley directed that session and played the sax, Ray Vasques played the organ, and we had a couple of brothers who played on it but I can’t remember. I recorded “Gentle Rain” and “Fine Day” in two different studios and I have two different versions of it: one at Chess in Chicago and one at Dave’s Fenton studio. We chose his over Chicago. D: That was the one issued on Fenton? R: Yes, but I have the other one on tape, if people want it, I have the masters for both. They are both good, just different flavors to them. D: How well did your solo project sell? R: It never got that much exposure. About that time I got married and started traveling the circuit, and was not home enough to promote it. At that time I was quite young and did not know the right people to get it to. It never went as far as it could have because of lack of hype and promotion. D: You talk about playing the circuit, where was that and what type of music were you playing? R: At first it was 60’s music because it was the 60’s when I firsts started traveling. As I started traveling west and north and south, I saw there was a big call for country music, for contemporary music, for show tunes – there was a call for a lot of things. Because I was playing so many types of clubs, I had to be versatile, and that’s what I strived to do during those years on the road. In the beginning, I to everything from Frank Sinatra to the Beatles, Gerry and the Pacemakers, and Simon and Garfunkel; and then I began to get into country. D: Did you record after leaving the Fenton label? R: We recorded a lot of things that were not released. D: When was the next actual released record? R: That would be the release on Renegade Records, “You Can’t Keep a Good Memory Down”/”Daily Grinds and Neon Signs,” which was recorded in ’78. D: So you didn’t record anything between ’67 and ’78? R: No, there was a big time lapse there. It cost a lot of money and I was financially embarrassed at the time. D: So you were basically playing the club circuit, but not doing any recording. R: Yes, then I decided to come home, get off the road and concentrate on recording. I had just gotten remarried then and decided that this was a nice place to bring up my family. That was when I got my new producer, went to Nashville and recorded in ’78. D: How did the Renegade records do? Did they chart at all? R: Yes, they did, in Grand Rapids as well as in Windsor, Canada. Then I really started promoting it in Europe and Manfred wrote an article in Europe and we sold the records out of the magazine. Then Otto from Denmark wrote about me and offered me on a cassette with Danish artists. Also Country Korral in Sweden did an article. D: Did it chart on Billboard’s Country Charts? R: No, but it was mentioned in The Gavin Report and Radio and Records. D: What are your current plans? R: I am releasing things on Renegade, but I am interested on getting on a major label. Last updated on May 24, 2004. The JuJus started as a trio doing a parody of the Beatles at Godwin high school in Grand Rapids in 1963. Members were Rod Shepard on guitar, Max “Junior” Colley on sax; and Bill Gorski drums, their name came from Max’s little brother’s pronunciation of “Junior”. In 1964 the band added Ray Hummel III on vocals and guitar and Rod moved to the bass. Hummel had a distinctive voice, and his talent for folk-influenced songwriting changed the band’s sound. Later on Rick Stevens of the Paeans (who had an unreleased 45 recorded at Fenton) came in to play guitar.The band played live shows at the Ponytail in Grand Rapids and nearby towns like Holland and Saugatuck. In 1965 worked out a deal with Dave Kalmbach of Great Lakes Recording to do their live act between films at the Hour Theater in exchange for recording time when the theater was closed.Great Lakes worked as a vanity label in that the bands had to cover all recording and pressing costs and do their own promotion. Studios were originally in Dave Kalmbach’s basement, then moved to the Hour Theater, and later to the nearby town of Sparta. Bands would chose whatever label name they wanted for their 45, Fenton being the most common choice. The records were pressed at the American Record Co. in Owosso, MI, later destroyed by fire in October, 1972. Rod Shepard says, “those records sold for about ninety-eight cents of which we ended up with about a dime.”The Ju Jus first 45 had two Hummel originals, the amazingly powerful You Treat Me Bad and the fifties-sounding Hey Little Girl. The record did well locally, supposedly reaching #2 on a chart in western Michigan in October, 1965. The future looked good and Drummond Records of Detroit offered Ray Hummel a contract based on his songwriting. The band couldn’t sign because a newly-married Ray refused to tour out of state, and Ray soon left the band. He recorded a few solo pop 45s over the years, including Gentle Rain / Fine Day on Fenton with Max Colley playing sax and Bill Gorski on drums.The JuJu’s had several personnel changes before making their next record. Brett Wells came in on vocals, and Bruce Essex, who had played guitar with Rick Stevens in the Paeans joined for part of 1966. Then Max Colley left and Bill Gorski was drafted, so the band found guitarist Ron Burke and drummer Ron Homrich. Before long Brett left and Ron Burke took over on vocals. Rick Stevens now became the primary songwriter for the band. 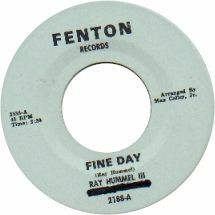 Though missing Ray’s unique vocals, their second 45, from 1966, is just as good as their first. I’m Really Sorry has been one of my favorite garage songs since I first heard it, and Do You Understand Me is a strong Stones-influenced punker with sharp guitar, buzzing sounds and broken glass. The United label is another band-financed record recorded through Fenton. In the summer of ’67 their manager Jim Geeting opened The Island, a teen club in Ludington, in which the Ju Ju’s played regularly and supported touring national acts like the Kingsmen and the Electric Prunes. By this time the band had a tougher rock sound. In late 1967 the band broke up as Rod Shepard and Rick Stevens went into the military. Rick Stevens joined the Air Force and later died in a plane crash in New Mexico. A number of unreleased songs recorded over the years at the Hope, Chess, and Phil Robert studios have yet to see commercial release. Until recently they were distributed on tape and CDR, but they are currently unavailable, and I haven’t heard them yet. 8 mm footage of The JuJus from 1965 courtesy of Bill Gorski, with additional photos from the collection of Ray Hummel III.